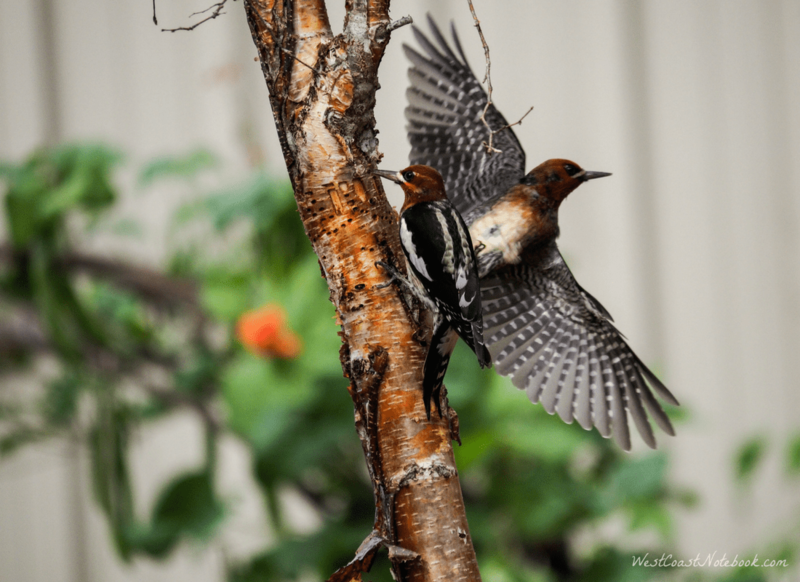 Unexpectedly a Red-breasted Sapsucker arrived in the yard today. 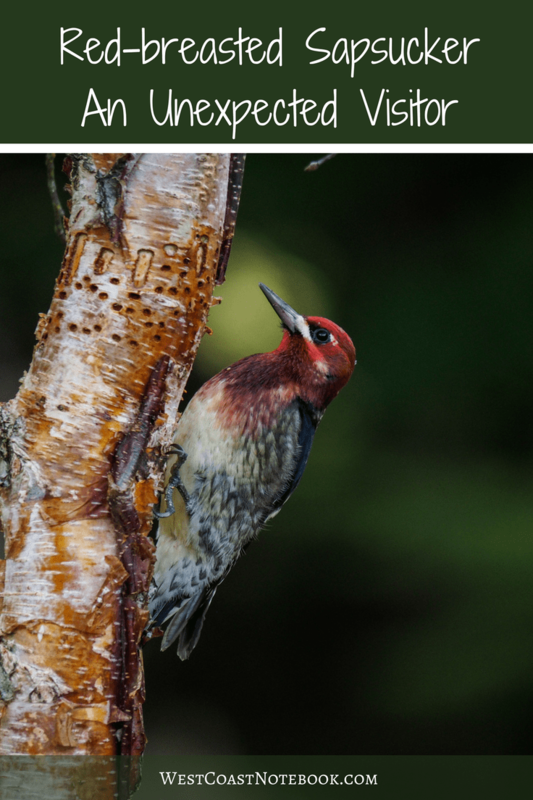 Not just one sapsucker, but two of them. In the past, I have sometimes seen them in the cedar trees here, but they are usually quite high up and you can hear them more than see them. I was just coming in the house and heard a racket coming from over near the garden. Looking up into the tree I saw nothing, but a flutter of wings caught my eye further down on the trunk and I saw them. I’m amazed I even got photographs of them because first, the weather was terrible for taking pictures and second I didn’t have my tripod with me so I had to handhold the camera. Normally that would be okay, but the shutter speed was really low because of the gloomy sky and I really had to put up the ISO. That might not mean a lot to you, but in reality, it means that the pictures are a little fuzzy and not as sharp as normal. 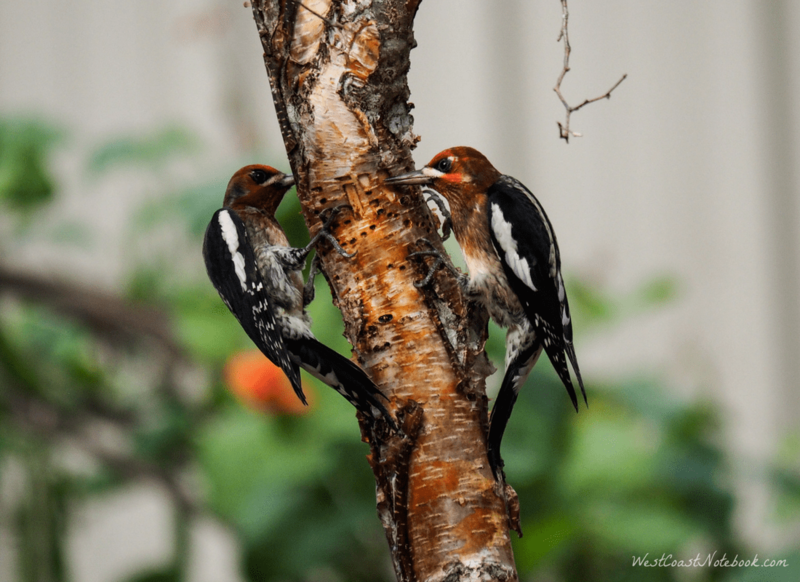 The tree that they were fighting over is a birch tree and they have been wonderful for attracting all sorts of birds. About 6 years ago we had someone that was moving that had the trees in half wine barrels and they didn’t have a place to store them, so we kept them in the yard for a year. They finally said they no longer wanted them and could we dispose of them. And of course… we just planted them. This worked out really well as we are surrounded by coniferous or evergreen trees so I was hoping that the birch would attract the warblers. Last year within one hour, there was a flock of warblers the moved through the yard as they migrated south. 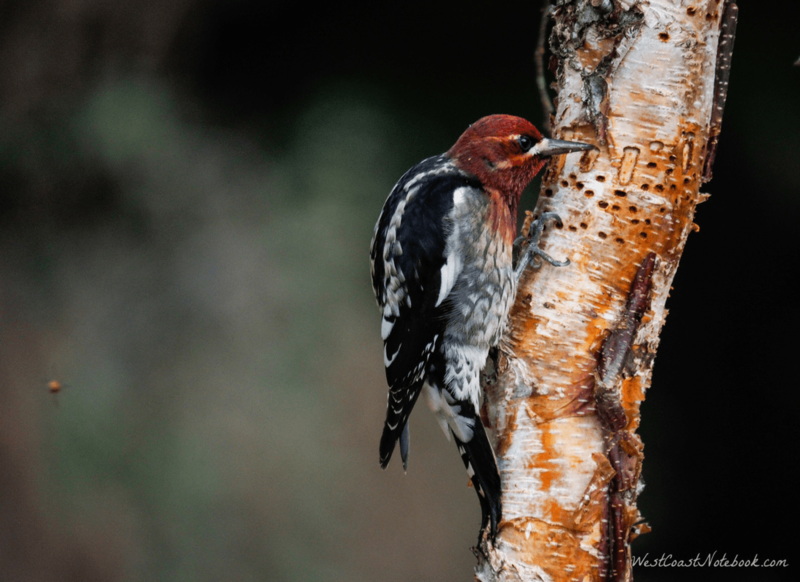 There were about four different species all at the same time and they feasted on the bugs on the birch trees. They were there one minute and gone the next. But… if it wasn’t for the deciduous trees I don’t think they would have stopped. The two of them were squabbling back and forth and finally, one flew off and headed out of the yard. Watching the one by itself it created new holes in birch and sucked the sap out. The pictures with the sap between its beak didn’t turn out very well, but it was interesting to see. I read somewhere that hummingbirds in particular rufous hummingbirds will actually follow the sapsucker around and feed off the hole it creates in the tree. In the future, keeping an eye on the birch tree is a top priority on a nice day because as you can see they have been there more than once from the number of holes already all around the tree. It’s nice to see how different birds are attracted to different trees. I’m thinking about getting a winterberry tree to see if I can coax some cedar waxwings into the yard.